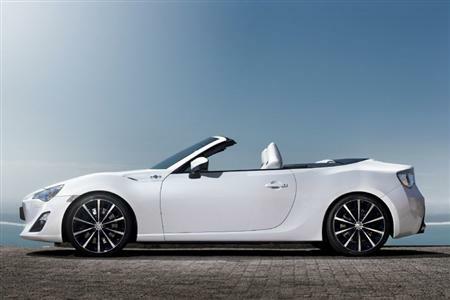 Toyota is displaying the FT-86 Open concept, a rear-wheel-drive sports convertible, at the 83rd Geneva International Motor Show. The FT-86 Open concept is a study model based on the rear-wheel-drive 86 sports car that is so successful in the marketplace. 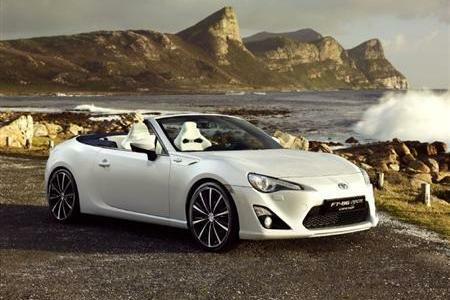 The concept features an electrically operated soft top, allowing a feeling of oneness with nature while maintaining the joy and sense of oneness with the vehicle that is apparent with the 86. A Milan-based designer colour coordinated the interior and exterior, with the resulting design evoking quality and sportiness. The interior and exterior feature high-contrast white and navy blue that emphasise the vehicle's proportions as well as the integrated nature of the design. In addition, yellow-gold stitching in the floor mats and seats acts as an accent conveying a sporty feel. The styling conveys a dramatically different impression when the roof is opened. The world premiere of the concept in Geneva is occurring at the same time as prototype engineering assessments take place.